This second solo-exhibition of one of Indonesia's most acclaimed artists is part of the Berlin Asia-Pacific Week Berlin 2018: Digitalization and is kindly supported by the Embassy of the Republic of Indonesia in Germany. 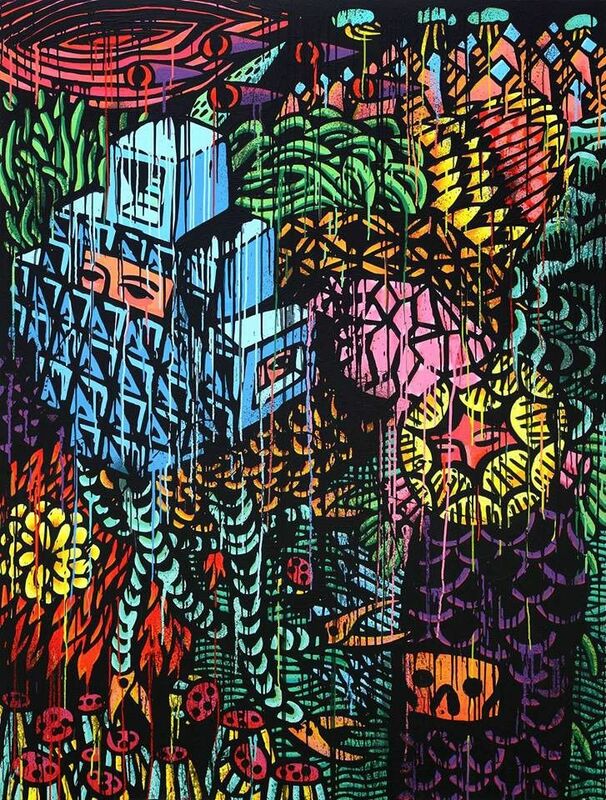 Eko Nugroho will present a major new mural painting together with new paintings on canvas and textile embroideries. As a special event during "Gallery Weekend Berlin", Nugroho will also install a pop-up store selling merchandise produced by DGTMB Art and Merchandising, in front of our premises in Fasanenstraße in Berlin Charlottenburg. Arndt Art Agency (A3) is pleased to present acclaimed Indonesian artist Eko Nugroho's solo exhibition “Plastic Democracy” at Arndt Art Agency Berlin upon the occasion of Gallery Weekend Berlin 2018. Characterised by plurality and taking many forms, Nugroho’s multidisciplinary practice investigates universal issues such as globalisation, human existence, corruption, cultural value systems and race through a critical, yet simultaneously humorous and playful lens. His work is grounded in both local traditions and global popular culture. In particular, he has cited the influence of traditional batik and embroidery styles. There is of course also a powerful inspiration from contemporary street art, graffiti and comics. In this way, his punchy, vibrant graphic aesthetic is often utilised in public interventions in the form of community murals and large-scale embroideries that explore social culture. 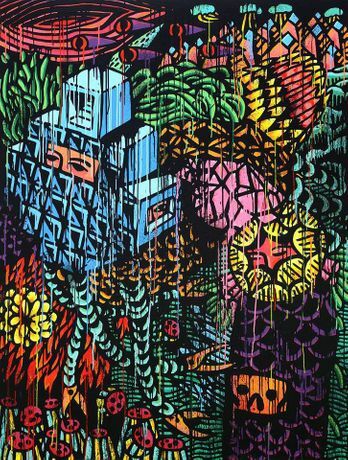 Nugroho’s unique ability to intertwine popular culture within the vernacular of contemporary art has elevated his practice to broad, international appeal. For his solo exhibition at Arndt Art Agency, the presentation will include a major site-specific installation in the form of a range of murals and a selection of characteristically vibrant large-scale manual embroideries and paintings. The works in the exhibition convey many recurring topics in the artist’s practice such as power structures, urban existence, freedom and truth exemplified in the following artwork titles “Nationalism v Nationalism”, “Make Humanism Great Again”, “Melihat Dengan Hati” (Seeing With the Heart), “Song of Whistleblower” and “Release Yourself to be Truth”. The sustained employment of visual motifs from his oeuvre to date such as cartoon-like, shrouded faces and figures are set against patterned decorative backdrops are also apparent in a range of key pieces. These visual environments in the works appear simultaneously at once as platforms for imagery to emerge from, but also engulf. Throughout Gallery Weekend Berlin, the artist will also stage a customised outdoor pop-up store in front Arndt Art Agency’s premises in Fasanenstraße presenting a range of limited edition artist merchandise for sale by the DGTMB SHOP.